Right now, you probably haven’t seen much rhyme or reason to your baby’s sleep patterns. While it may be a little aggravating that your baby isn’t sleeping through the night like you’d like, rest assured that it’s totally normal. In the next six weeks or so, you will start to notice that baby’s sleep will become more organized, both during the day and at night. Right now, his tummy is growing to allow him to drink more at each feed; he’s also starting to produce hormones like melatonin and cortisol that will help him experience circadian rhythms, like adults do. While sleep will become much more concentrated at night, most babies are still up twice a night to eat during this time period (6-12 weeks); for some, it’s once a night. By the END of this period (12 weeks), your baby should be moving toward three regularly scheduled naps per day. This should allow you to create a (somewhat) predictable daily schedule. The duration between naps will be about 45 minutes to two hours for a total of 11-15 hours of sleep per day. Many babies only take crappy little 20-30 minute naps (the “crap nap”), especially when they suspect you have important things to do. While frustrating, this is actually quite normal because 20-30 minutes is the length of time of a daytime sleep cycle, so we sometimes see babies wake at this point if they become aroused and don’t enter into another sleep cycle. You can try to get them back down, although it doesn’t always work. Don’t sweat it; you can only control so much. The next month is when most babies start extending their sleep to 4, 5, or 6+ hours at a time during the night; around eight weeks seems to be a popular time for this to happen. Yippy Skippy! About half of you lucky dogs will have a baby sleeping through the night (STTN) by 12 weeks, defined as 7+ hours of continuous sleep. For others, it will take a little longer. Try not to get frustrated; there’s not much you can do to rush it. If your baby is sleeping 5+ hours by 12 weeks, I’d say you’re in pretty good shape! Try to be patient. How long a baby will sleep depends on MANY factors, but weight is the most significant one. Most babies are “eligible” to STTN when they hit the 11-13 lb mark. Those of us that had babies the size of a Thanksgiving turkey (10+ lbs) will get there REALLY fast, while those with smaller babies will take a while longer [hey, count your blessings, at least your cooch didn’t get destroyed; you win some, you lose some 😉 ]. During the next six weeks, my goal for you is to reduce the number of times you are waking at night to feed, hopefully to one or zero times per night by the end of three months (although some will still wake twice to feed). Trust me, I will not let you become one of those parents who is waking twice a night to feed a 1-year-old merely out of habit. But for now, it’s still quite early: if your baby needs to eat, he needs to eat. You should be entering a no-pooping-during-the-night period very soon, if you haven’t already. When baby wakes up, give her a sniff to see if there’s a poop and only change it then. Cow’s milk allergy, an intolerance to a protein found in cow’s milk, affects about 2-3% of infants. Most of these are babies who are being fed cow’s milk-based formula. Breastfed babies can also be affected by cow’s milk allergy if their mothers consume cow’s milk while nursing. However, food sensitivities in breastfed babies are not nearly as common as many breastfeeding mothers have been led to believe. Symptoms of cow’s milk allergy include GI problems, such as vomiting, diarrhea (not to be confused with runny newborn poop), abdominal cramps and bloating. They may also get skin rashes and experience respiratory problems like coughing and a runny nose. A cow’s milk allergy not only causes general distress, but can also cause sleep problems like shorter sleep cycles and reductions in total sleep time. *Contrary to popular belief, cow’s milk allergy is not the same thing as lactose intolerance. Gastroesophageal reflux (GER) is the backward flow of stomach contents up into the esophagus or mouth. This is due to a poorly coordinated gastrointestinal tract in infants. “Most, maybe all, babies spit up and no treatment is required,” said Dr. Ian Holzman, Chief of Newborn Medicine at Mount Sinai School of Medicine. The question is whether or not the reflux is causing pain or other complications known as GERD (Gastroesophageal reflux disease), such as failure to gain weight, bleeding, respiratory problems or esophagitis. GERD usually presents as vomiting, pain associated with regurgitation along with arching back and feeding refusal. Talk to your pediatrician if you suspect your baby is suffering from GERD, but first consider that it may be the aforementioned cow’s milk allergy. Also, know that many drugs may be overprescribed for babies who have GER or GERD. Read more about GER in infants here. Recent research has indicated that snoring in infants may not be as harmless as was once thought. Snoring babies may suffer from obstructive sleep apnea syndrome, in which the upper airways repeatedly or partially collapses, which almost always causes baby to wake up. Obstructive sleep apnea prevents babies from getting enough “quality” sleep, but it may also deprive them of oxygen, which can cause a variety of more serious developmental problems down the line. Worse, if infants don’t awaken when they experience breathing difficulties, they are at higher risk for sudden infant death syndrome (SIDS). Consult your pediatrician if you suspect your baby is suffering from sleep apnea (with or without snoring). 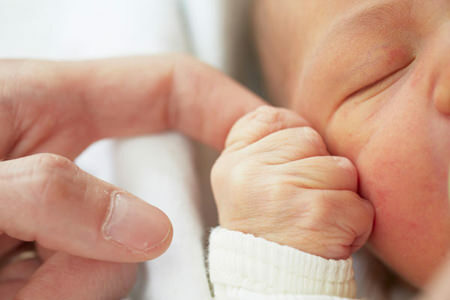 If you suspect your baby has one of these problems, consult your pediatrician. Parents report drastic improvements in their baby’s sleep when these types of problems are officially diagnosed and resolved. Happy six weeks; you’re doing great, Mom and Dad!! Stay the course, the hard part is almost over. Next Sleep Issue: Put Your Baby on a Schedule? Yes!